The owner approached Audio7 during the planning stage to make sure that what he wanted was incorporated in the Baufritz design. 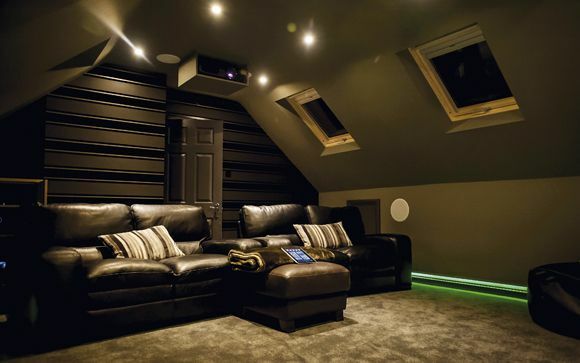 The brief included high-quality distributed audio and video throughout the house from a single central location, and a cinema room in the basement. The owner requested that all zones be controlled through a single point and easy to use, and that the control system would handle lighting and an intercom. Audio7 was even tasked with installing a 'business-grade data network'. Alex Josling, a director at Audio7, reveals that as well as performance considerations, 'the aesthetics of the system was an important factor'. The TV screens throughout the house (from Samsung and Panasonic) had to suit in both size and look, and discreet in-ceiling or in-wall loudspeakers were required everywhere but the basement movie den. Other considerations included isolating the loudspeakers to reduce unwanted sound transmissions between rooms, and careful placement of network connection points to allow for future additions, and cater for where the owner might want to use his laptop. A storage room in the basement of the house accommodates freestanding Middle Atlantic AV racks. Source kit, including Sky+HD units and an Oppo Blu-ray player, is installed here along side seven Linn DS network music players, amplification and system control. The modern-looking cinema features a JVC D-ILA projector and Screen Research 16:9 ratio screen (chosen because the owner watches a lot of sports and TV). The sound system is a traditional seven-channel design, with the front three in-wall speakers placed behind the acoustically transparent screen – doing this required the construction of a slim baffle to sit in front of the basement's concrete walls. Control here is handled by an RTI RF-based controller, while the rest of the house is dotted with Control4 in-wall touchscreens. Meanwhile the basement Blu-ray bunker is being used more than originally thought, with the owner and family regularly getting together for some bigscreen, surround sound action. And who can blame them?